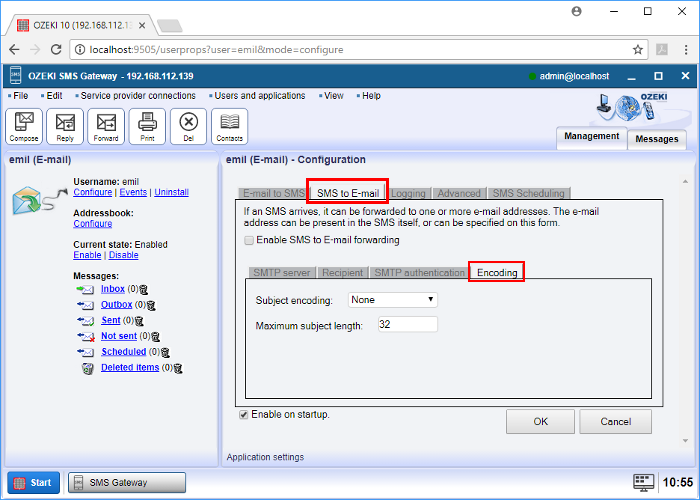 This step-by-step guide shows how you can configure an E-mail User, so it can forward incoming SMS messages from a standard email client. The recipient's email address can be configured in the E-mail User or it can be the first word in the received SMS message. An E-mail User can be installed and configured on Ozeki SMS Gateway to send and receive email messages. This page is about sending, so you should connect this user to an SMTP server (Figure 1). E-mail Users can be easily installed and configured through the browser GUI of Ozeki SMS Gateway. On the E-mail Users's 'Configuration' panel please select the 'SMS to E-mail' tab, so you can configure sending emails through SMTP server. The 'SMS to E-mail' tab consists of 4 sub-tabpages: 'SMTP server', 'Recipient', 'SMTP authentication' and 'Encoding'. You will read more of these in this guide. Start with the 'SMTP server' tabpage to set the SMTP connection (Figure 2). SMTP is an internet standard for email transmission. SMTP servers are used for relaying outgoing emails. On the 'SMTP server' tabpage, please enter the SMTP server's IP address or domain and the port number. Then select the email address of the sender and tick the checkbox to include the sender's phone number in the sender's email address. Now switch to the 'Recipient' tabpage (Figure 3) and make sure the emails are sent to the correct address. In the textboxes you can set the main address and the carbon copy (CC) addresses. If you tick the checkbox, the first word of the SMS will be the recipient(s) address(es). In this case only email addresses in the SMS message will count. Multiple email addresses should be separated by semicolons both in the SMS or in the CC field. In case your SMTP server requires authentication, click on the 'SMTP authentication' tabpage to provide the username and password. Please do not forget to tick the 'My SMTP server requires authentication.' checkbox. You can also choose SSL connection if your SMTP server has a more secure connection (Figure 4). 'Encoding' tabpage is the 4th tabpage, so you can select the encoding of the email subjects. You can also set the maximum character length of the subject (Figure 5).